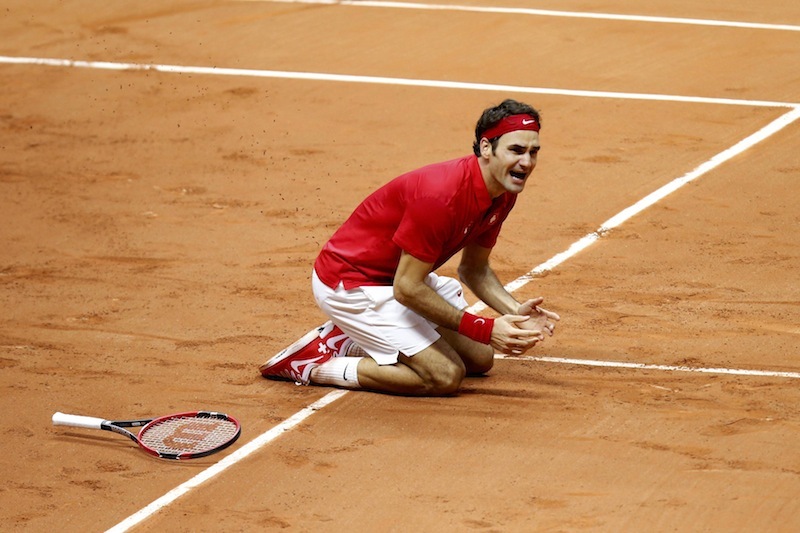 Roger Federer celebrates after winning the Davis Cup title for Switzerland in Lille on Sunday. Lille: Swiss Tennis player Roger Federer gave his country its first Davis Cup title in Lille on Sunday, defeating Richard Gasquet of France in straight sets of 6-4, 6-2 and 6-2; seal Switzerland’s maiden Davis Cup title with a 3-1 win over hosts France on Sunday. The 17-times grand slam champion came back strongly from back injury and recovered from Friday’s defeat by Gael Monfils to hand France a third defeat in their last three finals. Federer with his 17 Grand Slam titles, six Masters titles and Olympic doubles gold and left with only an Olympics gold to win in Rio 2016 to become the third person in the world after Nadal and Andre Agassii , to win all 4 grand slam titles including Olympic and Davis Cup title. Federer had expected to play Jo-Wilfried Tsonga in the first of Sunday’s two rubbers, but the French number one, who lost to Wawrinka in four sets on Friday, was struggling with an arm injury and forced to pull out. With a support of record 27,448 supporters Gasquet performance was decent and also not so energetic under his home support. Gasquet, sent to the clay court by Captain Arnaud Clement in place of Jo-Wilfried Tsonga, looked slightly better at the beginning of the third set as Federer became careless. But the Swiss, who withdrew from last Sunday’s ATP World Tour final with a back injury, was still the sharper player and he broke on his first opportunity in the fifth game when Gasquet sent a backhand wide. Stan Wawrinka gave them the first point by beating Tsonga in the first singles rubber before Monfils levelled on Friday. Switzerland was 2-1 up going into Sunday’s reverse singles after Wawrinka and Federer teamed up to beat Gasquet and Julien Benneteau in the doubles on Saturday. The fifth match between Wawrinka and Monfils was cancelled.